A good way to remember the French term le jardin potager is to think of it as a garden that grows everything a good French cook will want to throw into the soup pot. A potager always has space reserved for herbs and aromatics. The seeds we started in the window sill in Lyon have been transplanted to the beds we made in our garden in the mountains. There are sunny beds, and beds that get partial shade. One of my goals is for my guests to have salads from my garden as a special memory of their visit with us, and the shade beds will be devoted to the typical salad greens and herbs that thrive when protected from the sun. Chervil, known in French as cerfeuille, is an important herb in French cooking. One of the fines herbes, it is readily available at French markets in thick handfuls ranging in price by vendor. Taste the chervil from several of the vendors you have identified as producers, and decide which you like best. They all taste different because they each use their own seed. When I first started market shopping in Lyon, I was drawn to chervil beccause of the beautiful dainty leaf that seems to glow in almost any light. It quickly became a regular addition to my basket. I use it fresh in salads, chopped into vinaigrettes, in fish fumet and to season seafood, eggs, and any dish that won't hide this herb's interesting flavor. Rub it between your fingers, and take in the aroma. It has a fresh slightly licorice scent, one that will quickly fade when cooked. Chervil is best used at the very end of your cooking process or kept raw in cold dishes, because the flavor comes through the best that way. The photo above is from our garden's first batch of chervil. It is growing in one of the shade beds. The oblong leaves are the first ones to come out when it sprouts, long and slender to take in as much of the sun's nutrients as possible. After about 10 days, the true chervil leaves began to come out. The sprout leaves will die off when the plant doesn't need them anymore. I will also scatter seeds in a space I have reserved for that, to keep chervil going in our garden as long as I can in the season. 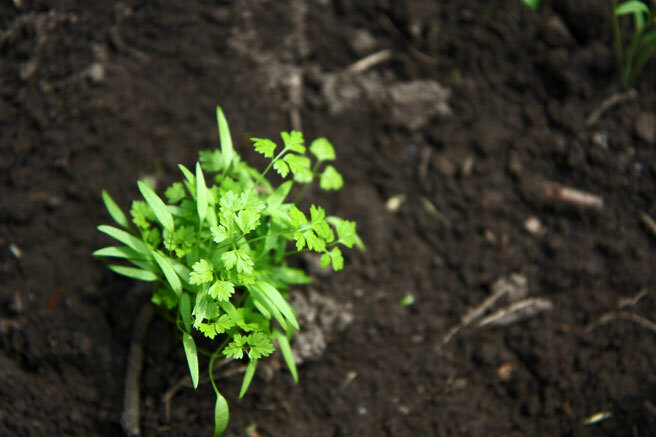 One advantage to planting chervil in your garden is that you can also use the roots, which I look forward to doing this summer. A first glimpse of Spring!! I've never used much of this herb, but from your description, I'll be trying it soon. Perhaps a few small settings from the plant vendors this weekend, if the rain allows us to plant the big round space. The hardy plants from last year are getting a good start---the marjoram and oregano cover a yard-round space each, and all the lavender is sending up its gray-green arms. The big sage has furry ears already, and I can see mint sprigs WAY over in the grass around the mother plant. And the DILL!! It practically took over the big center space last year, and we used some every day, it seemed, and gave great sheaves to the neighbors. I'm so pleased to see your sweet mountain garden, and will look forward to seeing much more as Spring and Summer progress. Thank you, Rachel. It sounds like your garden is going to give you lots of fun this year. oh i love the sight of herbs growing... it's spring and it's beautiful! Thank you, Aran. It's very sweet of you. A little finely chopped chervil added to a bowl of clear chicken soup just before serving is very soothing . I like it in chicken soup too. When I serve mixed poultry consomme I usually present it with chevril sprigs floating on top. For some unknown reason I never use this herb. I think I'll give it a try. Thank you. Where is my mind! I completely forgot to plant chervil in my new herb garden. Fortunately, it's early enough and I still have room.